On October 29, 2012, Hurricane Sandy battered the Eastern Seaboard of the U.S causing massive damage in 24 states from Florida to Maine. The worst of that damage was centered on New York and New Jersey. Seaside Heights, New Jersey was hit with 80 mph winds and a 9 foot storm surge. 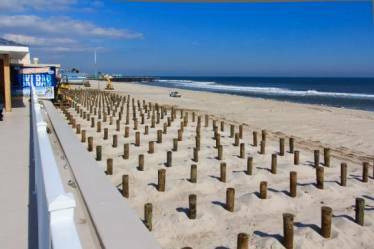 When the hurricane had passed, the entire mile long length of the Seaside Heights boardwalk was destroyed, as well as a large portion of the Casino Pier that connects to it. 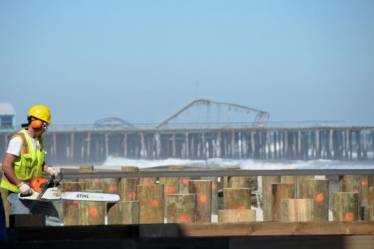 The collapse of part of the Casino Pier at one end of the boardwalk left the Jet Star roller coaster, which formerly sat atop the pier, a twisted mass of metal sticking out of the surf. When rebuilding began, the contractor who was awarded the $13 million boardwalk replacement contract contacted Portland Bolt. The contractor was faced with a very short timeline to complete the job in order to have the boardwalk reopened in time for the 2013 tourism season. Within a week and a half, Portland Bolt was able to ship the first release of nearly 4,000 galvanized 1” diameter timber bolts to the job site. Over the following month we also manufactured and shipped close to 11,000 galvanized 1/2” diameter timber bolts. Our in-house hot-dip galvanizing line and our experience with time critical orders allowed us to meet the contractor’s critical delivery dates and keep the project on schedule. As reconstruction continues, we will be manufacturing additional shipments of galvanized fasteners for the ramps, guardrails, and forthcoming seawall construction. 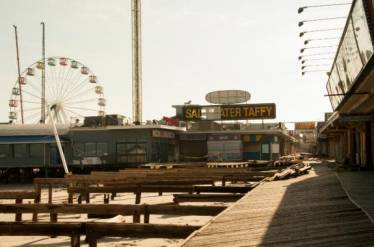 Originally constructed from 1916 to 1921, the Seaside Heights Boardwalk was destroyed by fire and rebuilt in 1955. Seaside Heights calls itself, “Your Home For Family Fun Since 1913!” and is also known as the location of the hit MTV show Jersey Shore. Hurricane Sandy was the second costliest hurricane in U.S. history and caused over $75 billion in damage. On September 12th, 2013 an electrical short started a fire underneath the southern end of the newly reconstructed boardwalk. 30 mph winds stirred the flames into a raging 6 alarm inferno that did significant damage to the boardwalk. Over 400 firefighters from all over New Jersey fought the flames for over 9 hours and finally contained the fire by cutting a 25 foot wide section of the boardwalk out as a makeshift firebreak. When the fire was finally contained, 32 businesses were destroyed, 20 others were damaged, and much of the recently rebuilt boardwalk was destroyed. 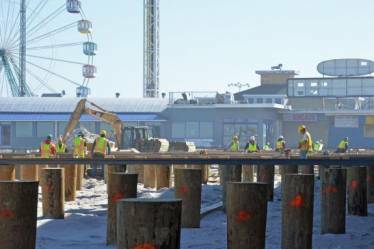 In the wake of the fire, numerous groups came together to help Seaside Heights rebuild the boardwalk a second time in the wake of the fire. All of the original contractors and manufacturers that supplied labor and materials for the post-Sandy rebuild stepped up to help the community in its time of need. As part of this effort, Portland Bolt donated one hundred custom 1 x 16 and three hundred 1/2 x 9 galvanized economy bolts that are required to rebuild the sections of the boardwalk destroyed by the fire. Reconstruction of the fire-damaged boardwalk is expected to be completed by early summer of 2014.